Though tin has had a rough start in 2017, analysts expect that increasing demand from the electronics industry and a decrease in supply will help sustain prices in the near future. Primary tin production is estimated to have fallen in 2016 in China, Indonesia, Malaysia and Peru, with similar decreases in secondary production in the US and Belgium. As a result, interest in tin investing is increasing. 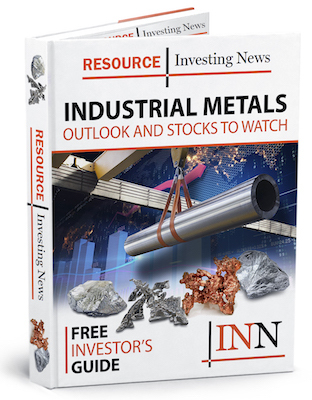 To help investors looking to jump into the sector, the Investing News Network put together a brief guide to tin supply and demand dynamics, as well as an overview of how to start investing in this silvery-white metal. The tin market has been in deficit for eight of the last 10 years, and is expected to remain in deficit as tin demand increases. Because of its many positive characteristics, there are a lot of uses for tin. For example, the metal is malleable, ductile and not easily oxidized in air; it’s also lightweight, durable and fairly resistant to corrosion. Those qualities make tin, which is obtained from the mineral cassiterite, a good candidate for use in solder, as well as tinplate, chemicals, brass and bronze and other niche areas. In terms of where tin is produced, China was the world’s top producer in 2016; it put out an impressive 100,000 MT of the metal. China was followed by Indonesia at 55,000 MT and Burma at 33,000 MT. Total world output for the year was 280,000 MT, and world tin reserves sit at 4.7 million MT. As of 2016, the world’s top tin-producing company was China’s Yunnan Tin (SZSE:000960), which produced 76,000 MT of refined tin. That’s well in front of second-place Malaysia Smelting (KLSE:SMELT), which produced just 26,802 MT in 2016, down 11.3 percent from the previous year. Like tungsten, tantalum and gold, tin is a conflict mineral. Armed groups in the Democratic Republic of Congo (DRC) earn hundreds of millions of dollars every year by trading these minerals. Currently, the Dodd-Frank Act in the US requires public companies that source minerals from the DRC to produce an independently audited report about the ownership and source of the mined commodities to the Securities and Exchange Commission. However, that could change soon if the Senate approves a repeal to the act that the House of Representatives recently passed. As mentioned, investing in tin is becoming more and more appealing as demand for the metal grows. Tin is also interesting for investors because of its ability to serve as a hedge against the US dollar and inflationary pressures in certain environments. Those wanting to begin tin investing may want to consider ETFs and futures. According to CommodityHQ, many ETFs include exposure to tin, generally along with copper, nickel, lead and aluminum. Tin futures are traded on the London Metal Exchange under the contract code SN, and are priced in US dollars per tonne. Clearable currencies include the US dollar, yen, pound and euro. Of course, tin investing can also be done by buying shares of tin-focused companies. Our list of the top tin-producing companies of 2016 may be a good place to start, though investors with more risk tolerance may also want to look at tin exploration companies.